Within events management, events are commonly categorised within two axes, size and content. Along the size axis events range between the small scale and local, through major events, which garner greater media interest, to internationally significant hallmark and mega events such as the Edinburgh Festival and the Tour de France. Content is frequently divided into three forms – culture, sport or business. However, such frameworks overlook and depoliticise a significant variety of events, those more accurately construed as protest. This book brings together new research and theories from around the world and across sociology, leisure studies, politics and cultural studies to develop a new critical pedagogy and critical theory of events. 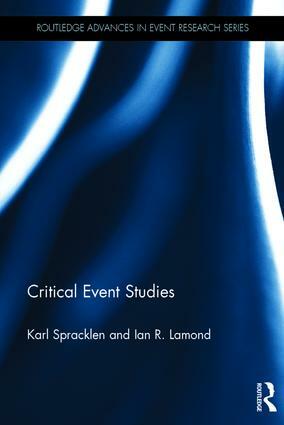 It is the first research monograph that deals explicitly with the concept of critical event studies (CES), the idea that it is impossible to explore and understand events without understanding the wider social, cultural and political contexts. It addresses questions such as can the occupation and reclamation of specific spaces by activists be understood as events within its framework? And is the activity of activists in these spaces a leisure activity? If those, and other similar activities, can be read as events and leisure, what does admitting them into the scope of events management and leisure studies mean for our understanding of them and how the study of events management is to be conceptualised? This title will be of interest to undergraduate and postgraduate students on events management and related courses and scholars interested in understanding the ways in which events are constructed by the social, the cultural and the political. 11. Can there be an Emancipatory Events Studies? Karl Spracklen is Professor of Leisure Studies at Leeds Beckett University. He has been Chair of the Leisure Studies Association and is currently Vice-President of Research Committee 13 (Sociology of Leisure) of the International Sociological Association. He has researched and published widely on leisure theory and leisure studies, with particular interests in music, tourism, sport, sub-cultures and the idea of communicative and instrumental leisure. Ian R. Lamond is Senior Lecturer in Events at Leeds Beckett University. He is a member of the Political Studies Association, Media Communications and Cultural Studies Association and Leisure Studies Association. His research interests are wide ranging and include: critical event studies; protest as event; events in contested spaces, event theory; and the sociology of political institutions.